We were very disappointed with this accommodation. On arrival, there appeared to be no room for us and eventually we were put into a huge cold room for the night. The next night we were moved to a smaller room next door with no balcony. Both rooms were basic and not very clean and no cleaners arrived at all during our four night stay. The apartments are very dismal and we could not have stayed here for a fortnight - that would have been an absolute nightmare. We've stayed in Benidorm several times before and always enjoyed it immensely but would never ever stay here again. The reception staff were very unhelpful to English holidaymakers in particular. There was a large group of Spanish holidaymakers here who were very rowdy til the early hours and nothing was done despite English families with young children complaining. Can't comment on food as had no intention of eating here. Location uphill but not too far to walk into new town. Staff unhelpful and rude. Entertainment non existent. Cannot recommend this place at all - would not even stay here for free!!! The hotel rooms were kept very clean maid acame in everyday. The evening entertainment was non existent. We were all inclusive, this was a big mistake, The food was rarely warm let alone hot,the queue for the bar was ridiculous (1 barman, bar left unattended while he had lunch). The poolside bar was closed as they had no facility to keep the drinks cold or the beer on draught. The pool was very small with 20 sunbeds for 300 guests!!! All out war when you finally got let out to poolside area. (10.00am)Partying in rooms until 5am was ignored unless they were English? First aid experience was questionable, a young lad cut his arm very badly the receptionist stood and did nothing other holiday makers had to step in. This hotel should be rated a 2* as any other rating would be wishful thimking. Definately not a hotel we would visit again. We booked these apartments (self catering at the time) because of the entertainment and retaurant facilities advertised. Although we usually go out a lot I have been unwell and wanted to be able to stay put a little at night. A full itinery of daytime and evening activities were listed. We arrived to find no entertainment and no restaurant open. The apartment was dirty. The TV didn't work. The towels & sheets were never changed in the 10 days we were there, despite many requests. The central heating was on full blast although the temperature was very high for February and we were roasting. We got little sleep due to local dogs barking all night. As we were spending all our time in the hotel next door, owned by same group, I asked about moving to there and paying for all-inclusive. I was told that this would be fine. We went to pay and was told that although all the price lists said the first child would be free, we would have to pay for her. I paid up in order to try to salvage the holiday. We were given all-inclusive cards, but no change of hotel! "Ask tomorrow" I was told. Asked the next day - same again. To cut a long story short our holiday was spent climbing hills between hotels and looking for our child who when with her friends was in the hotel as there was nothing to do except swim at our apartments and we certainly didn't weant to be in that apartment for long. Even the Rock Gardens Hotel was nothing to shout about, dark, dismal and dingy - the entertainment room smells of cat pee. Even the 'free trip' we booked with the hotel went wrong as we were not given the neccessary tickets and we were dissapoinmted once more. We were offered a move on day 7 of 10 to Finistrat! I didn't feel up to packing and moving so far. Eight men from 40-58. We knew location before we went,so not a problem walked into town at night taxi back at night about 5 euros from centre. I loved the hotel, but we had to have entertainment in the magic rock gardens. I didn't like the hill much but the staff there were really friendly I would definitely go here agin in fact I'm going there for my birthday and I can't wait. Traveled to this hotel arrived at 11 o clock. Just got dropped off outside no rep at all room was not ready till 2 o clock. We asked for two rooms for 6 of us and given 1 with a couple of beds thrown in the pull out bed was a disgrace. We went all inclusive but were put in apartments and had to walk to the main hotel up the road to get food. Hotel is up a steep incline not good for the aged. Found the hotel staff not very friendly and the bar man we nicknamed Frank the crank. No entertainment at all it was all at the main hotel magic rock gardens which were ok. The beds smelled like urine as if someone couldn't get into the toilet and went on the mattress instead. When I used the sink it I was shocked to discover it was stuck down with chewing gum. The fridge in our room had also been pulled out from its socket, and the microwave was at the other corner of the room. There was also 250 empty San Miguel bottles, 4 empty bottles of vodka, 6 empty bottles of champagne. I can only assume the person had a drinking problem. When I looked out the window I saw trainers, a frying pan, t-shirts, a dress, a pillow from a couch, countless bottles of beer and much much more. Arrived at hotel and thought oh my god when we seen the hill.No problem if you are young to access hotel up the top of cardiac hill. We have stayed there twice and thought the place to be very good. Reception staff very efficient and abrupt as we thought until our second visit when we were recognised then couldn't have done enough for us. The apartments are very clean and the rules are very strict as 80% is Spanish owned private accomodation. Pool area very good and clean,no bar facilities which is a bonus but could use hotel next door. 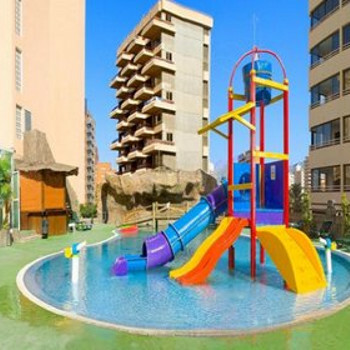 We have been to numerous hotels in Benidorm but would make this apartments my destination should I visit again. NOT RECOMMENDED FOR THE ELDERLY OR DISABLED DUE TO LOCATION UP HILL..not for young groups either. Although the apartments are on" heart attack hill"i found them to be great.The reception was clean as were the rooms, the staff were great,nothing was too much trouble.We stayed self catering so i can not comment on the food. The nightly entertainment was ok, but the night clubs are better. I would recommend this place to anyone,i am going back there myself.